I'm not a big fan of eating out on common eat-out holidays—the crowds, far advance reservations, and all-too-often prix fixe only menus all add up to make the experience not one entirely fitting with the low key type of celebrations I prefer. So when it came to Mother's Day this year—the first one since high school where my Mom and I have lived in the same city—I decided rather than deal with brunch madness, I'd host and cook a lunch comprised of my Mom's favs, which included eggplant parmesan and asparagus. 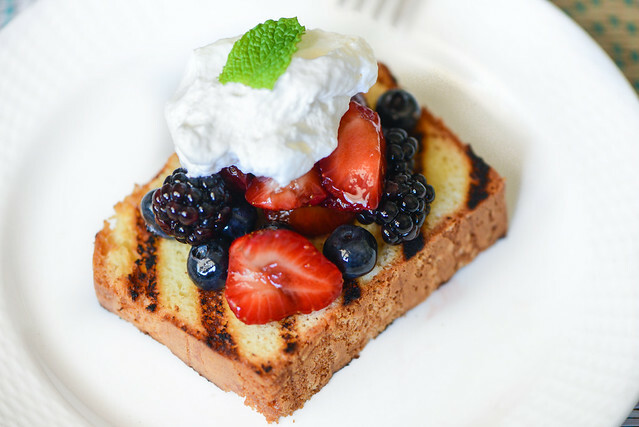 Then to cap the meal in a fittingly special fashion, I made this grilled lemon pound cake with balsamic berries and whipped cream. I feel like it's really summer when watermelon starts showing up at most all gatherings. This fruit is specifically designed for outdoor consumption with its dripping juice providing an equally refreshing and frustratingly messy experience that would feel out of place if it weren't enjoyed in the heat a of summer at a picnic or cookout. 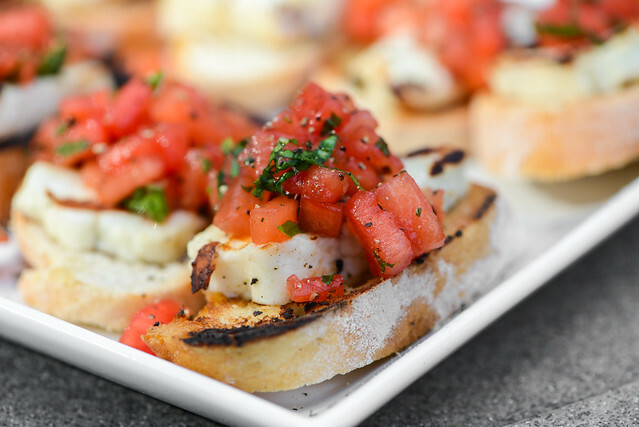 So to kick off what is now summer using the watermelon barometer, I give you these appropriately light toasts topped with grilled halloumi and dressed with a watermelon and mint salad. In my last post, I reminisced on how my past picky eating habits led me to a love of Vietnamese barbecue beef—it was the only thing that sounded non-frightening to me at my first Vietnamese dining experience. I also found humor in that my old self wouldn't venture past that singular item once I deemed it an appropriate fit for my palette. 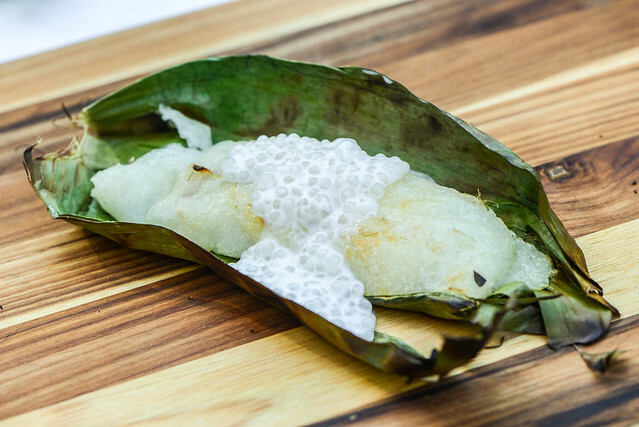 In contrast, this week I'm finding another Vietnamese item as example of the distance I still have yet to go to become the ideal eater I wish I was, because while I cooked up these grilled bananas wrapped in sticky rice, they represented food aversions I'm still not able to shake. I have a running list of recipes where I can jot things down in any moment of inspiration. It's something I've maintained for many, many years, which means some of those items date back to my earliest days of grilling. 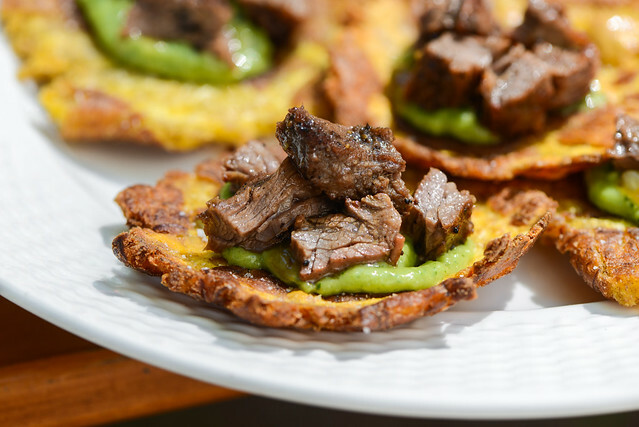 One such long standing idea was to use tostones—fried green plantains—as a serving piece with steak and sauce adorning it, a nice little appetizer in my mind. I tend to build Meatwave menus from that recipe list—after forming a theme, I pick and choose from the list to assemble a grand feast. So it came to be at a recent Venezuelan inspired Meatwave that this tostones idea finally found a home, and I was sure glad it did. Just before I began writing this post, my wife told me one of the sweetest things—she picked up a pint of fresh strawberries at the farmer's market on her way home. It was soured though when she made it clear they were intended for her own personal smoothie use. Oh what a cruel fate, in the height of strawberry season I have my favorite fruit in its most delicious state sitting in the kitchen and was instructed not to eat it. 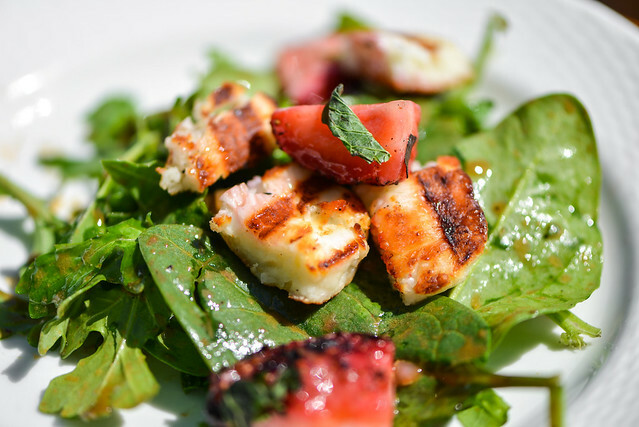 There's no way I was going to be beholden to those demands and have already sneaked a few berries for myself, and that led me to thinking this is a perfect time to bust out this recipe for a strawberry and halloumi salad dressed in a balsamic vinaigrette.